11 Days After Typhoon, Parts Of Philippines Yet To Be Helped : The Two-Way The numbers about the superstorm's effects keep getting worse. Officials say that nearly 13 million people were affected by Typhoon Haiyan, with at least 4 million left homeless, and that some haven't been reached yet on remote islands. 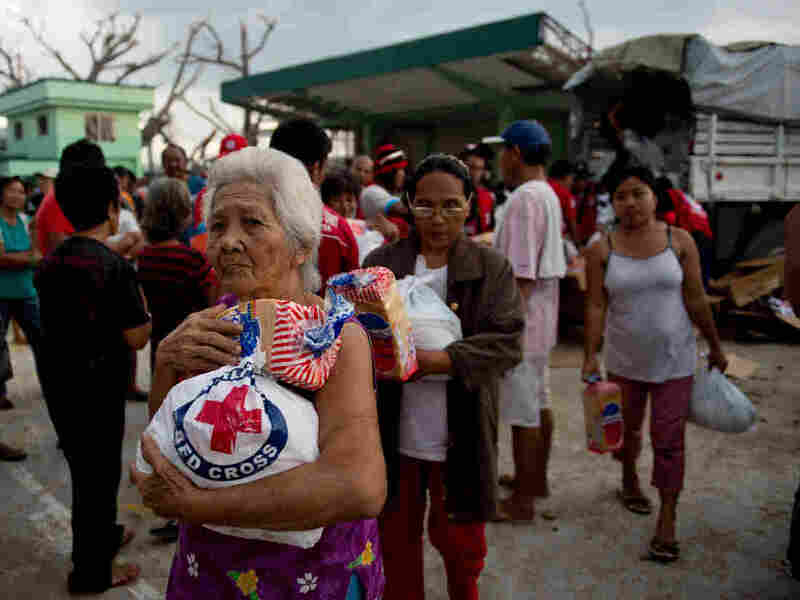 An elderly woman and others leave after getting some help from Red Cross volunteers Monday in Dagami, the Philippines, about 20 miles south of the city of Tacloban. Millions of people need assistance because their homes were destroyed by Typhoon Haiyan on Nov. 8. On Day 11 of the disaster caused in the Philippines by Typhoon Haiyan, "I am not so sure that we've reached every single portion of the territory where people are in need of aid," Bernard Kerblat, U.N. High Commissioner for Refugees representative for the Philippines, said Monday. Reuters adds that another U.N. official, Orla Fagan from the Office for the Coordination of Humanitarian Affairs, described the scope of the challenge facing relief workers as "massive ... between 10 and 12.9 million people have to be assisted to recover from this. This is absolutely huge. It's like taking the whole of Belgium and trying to assist." The figures about Haiyan's effects on the Philippines keep getting worse. On Saturday, officials estimated that 1.9 million people had been forced from their homes when Haiyan (known as Yolanda in the Philippines) struck the island nation on Nov. 8. Now, the U.N. says at least 4 million people were displaced. Meanwhile, the Philippine government says the official death toll stands at 3,976. That's up from Sunday's estimate of 3,681. Help has been arriving. The U.S., Australia and other nations have sent aid and military personnel. But as The New York Times writes, feeding and housing the millions who have been displaced or need help is proving to be a huge challenge. "The evacuation centers are an increasing concern," Matthew Cochrane, a spokesman for the United Nations Office for the Coordination of Humanitarian Affairs, tells the Times. "People are living in squalid conditions in need of as much support as they can get." Monday on Morning Edition, NPR's Jason Beaubien reported about how many in the predominantly Catholic nation turned to their churches over the weekend for "something positive, something beautiful and a place to come together as a community."